Flock Web Browser was once a darling of the web. It was among my favorite web browsers out there until a few years ago. But then Google Chrome happened which raised the bar much higher eventually changing the whole internet space once and for all. Mozilla Firefox suddenly became *old* and had to re invent itself to survive[read Firefox 4.0]. Unfortunately, that was not the case with Flock 'Social Media' Browser. Why is Flock Shutting Down? According to the promoters, "the Flock team joined Zynga in January, 2011 and is now working to assist Zynga in achieving their goal of building the most fun, social games available to anyone, anytime -- on any platform. 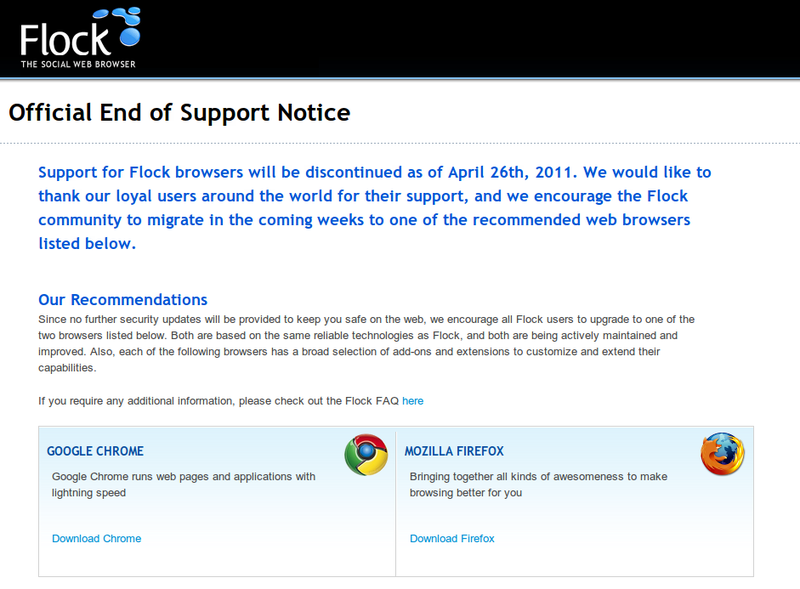 Flock will no longer be actively maintained, which means you can keep using the product, but key features will stop working after 4/26/11 and over time the browser will no longer be secure as software updates and upgrades will no longer be provided." More info at Support FAQ. On a last ditch attempt recently, Flock even had a complete makeover by shifting its base from Firefox to Chromium. But as we all know by now, even that didn't worked. 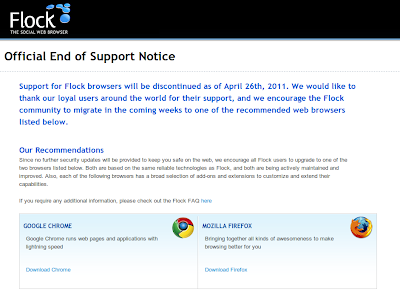 And Flock Web Browser is shutting down. Browser wars has claimed its yet another victim.